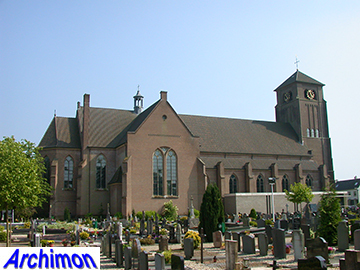 After the catholics of Bemmel had lost their church to the protestants during the Reformation, they had gathered in several successive barn churches, the last of which was built in 1803 and modified in 1842 to look a bit more like a real church. 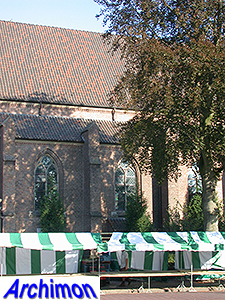 A true church was built in 1872-1873. 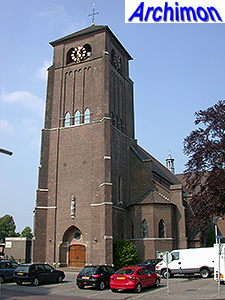 It was a towerless, three-aisled basilica, designed by H.J. Wennekers. 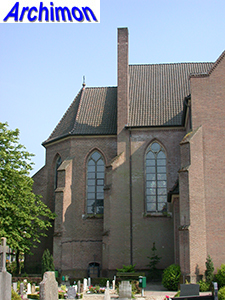 This architect from Zutphen was one of the most important builders of catholic churches in the Archdiocese of Utrecht and a pioneer of the neo-Gothic style in that area. 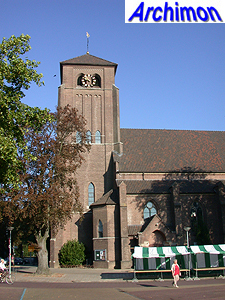 He based his design on the example of the Broederenkerk in his home town and even copied the large choir of this former collegiate church, which made it a bit unpractical for a parish church. 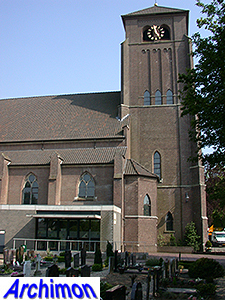 In 1926 a 56 meters tall tower with two flanking chapels was added to the church. These were designed in a late neo-Gothic style by H.C.M. van Beers. 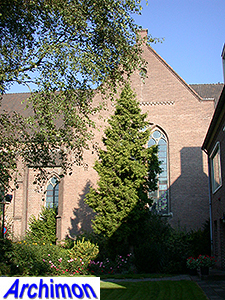 The church did not last long in this form; from October 1944 until April 1945 Bemmel lay in the frontline, and the church was damaged by artillery. Photographs from this period show varying states of damage especially at the tower which first lost its spire and later its upper part, but the church as a whole was still complete and appears repairable. 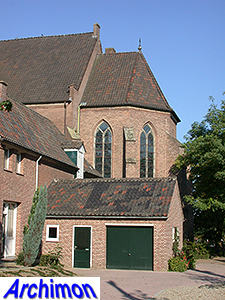 However, various sources claim the church was largely destroyed, and in 1946 a temporary church was opened elsewhere in the village. Not much later work architect Joh.H. 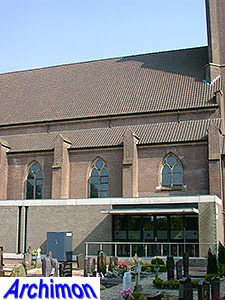 Sluijmer was given the assignment to design a new church. 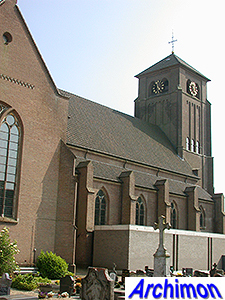 Part of the needed money came from Hilversum, where the St. Vitus church held weekly collections for four years. Construction began late in 1948 and was completed in July 1950. 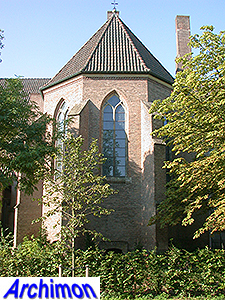 Van Beers' tower had largely survived but lost its neo-Gothic shapes; a big pointed window at the front was closed and the entrance was replaced by one in Traditionalist style. As the tower had lost its spire and uppermost segment, it was now only 34 meters tall and was covered with a pyramid roof. 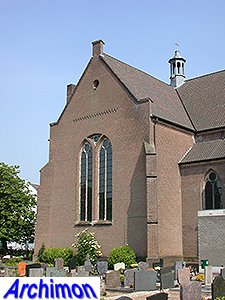 The chapels on both of its sides also survived without major damage. A picture made in the early stages of the construction suggest that the outer walls of the side-aisles also survived and were re-used without many changes. 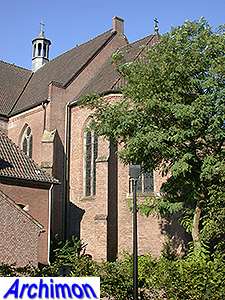 The new central aisle was built to a lower height than the previous one, without a clerestorey, making the church a pseudo-basilica. The addition of a transept gave the interior some more light. Oddly, its windows are not pointed, unlike those of the nave and choir. This choir was probably all new, and certainly shorter than its predecessor, but has neo-Gothic windows similar to the nave. The church was entirely vaulted. In the late 1990's the church was restored, but in 2012 the announcement was made that it would be closed. Almost immediately locals began making plans to save the building from demolition. The last service was in February 2015, and in the next year and a half the church internally was transformed into a theater. As such, it reopened in October 2016.